Emergency lighting is lighting for an emergency situation when the main power supply is cut and any normal illumination fails. The loss of mains electricity could be the result of a fire or a power cut and the normal lighting supplies fail. This may lead to sudden darkness and a possible danger to the occupants, either through physical danger or panic. Emergency lighting is normally required to operate fully automatically and give illumination of a sufficiently high level to enable all occupants to evacuate the premises safely. Most new buildings now have emergency lighting installed during construction; the design and type of equipment being specified by the architect in accordance with current Building Regulations and any local authority requirements. The British Standard provides the emergency lighting designer with clear guidelines to work to. BS 5266-1 embraces residential hotels, clubs, hospitals, nursing homes, schools and colleges, licensed premises, offices, museums, shops, multi-storey dwellings, etc. Although this standard recommends the types and durations of emergency lighting systems relating to each category of premises, it should be remembered that the standards are the minimum safe standards for these types of building and that a higher standard may be required for a particular installation. Lighting that automatically comes on when the power supply to the normal lighting provision fails. Emergency lighting is a general term and is sub-divided into emergency escape lighting and standby lighting. Emergency escape lighting – that part of an emergency lighting system that provides illumination for the safety of people leaving a location or attempting to terminate a potentially dangerous process beforehand. It is part of the fire safety provision of a building and a requirement of The Regulatory Reform (Fire Safety) Order 2005. Standby lighting– that part of an emergency lighting system provided to enable normal activities to continue substantially unchanged. This guide does not include standby lighting as it is not a legal requirement and is a facility that may or may not be needed, depending on the use and occupancy of the premises, etc. Emergency escape lighting is itself sub-divided into escape route lighting, open area lighting and high risk task area lighting. 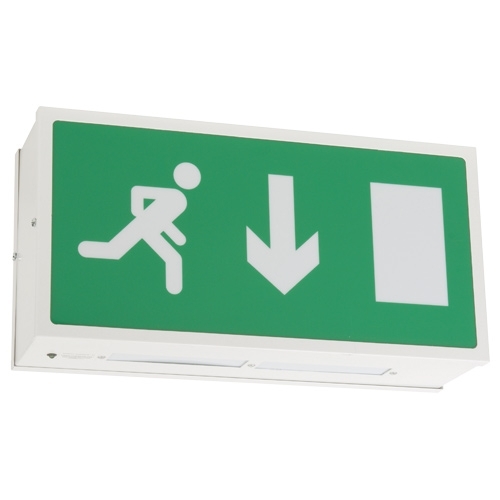 Escape route lighting – that part of an emergency escape lighting system provided to ensure that the means of escape can be effectively identified and safely used by occupants of the building. Open area lighting (in some countries known as anti-panic lighting) – that part of an emergency escape lighting system provided to minimise panic and ensure there is sufficient illumination to allow the occupants of a building to reach a place where an escape route can be identified. High risk task area lighting – that part of an emergency escape lighting system that provides illumination for the safety of people involved in a potentially dangerous process or situation and to enable proper shut-down procedures for the safety of the operator and other occupants of the premises. The first stage of installing emergency escape lighting is consultation and design. The designer, responsible person and fire risk assessor should meet and decide where the escape lighting is required and mark up a plan showing the areas to be covered, the type (power supply), mode of operation, facilities and duration. Low hardware equipment costs – no requirement for extended wiring, special ventilation etc. In general, the decision to use either a central battery or a self-contained system is likely to be cost determined. If an installation has longevity and low maintenance as priorities, then the higher cost of a central battery may be acceptable on a very large project. Typically, luminaire and installation costs are a major consideration, particularly on smaller jobs, and it is this criterion which makes the self-contained luminaire the most popular choice. Maintained or non-maintained is the principal consideration, which is decided by the use of the premises. Maintained emergency luminaire: a luminaire in which the emergency lighting lamps are on at all times. Maintained mode is generally used in places of assembly such as theatres, cinemas, clubs and halls; the full list is contained in BS 5266. The lights are typically dimmed when these premises are occupied and the emergency escape lighting prevents total darkness. Maintained fire exit signs are also used in public spaces even where these are well lit to offer clear escape route guidance in evacuation situations where the power does not fail. Non-maintained emergency luminaire: a luminaire whose emergency lamps only come on when the power supply to the normal lighting fails. Non-maintained is the typical mode in a workplace or similar environment in which artificial lighting is normally deployed while the premises are occupied. Combined emergency luminaire: a luminaire containing two or more lamps, at least one of which is energized from the emergency lighting supply and the other(s) from the normal lighting supply. A combined emergency luminaire can be either maintained or non-maintained. Compound self-contained emergency luminaire: a luminaire providing maintained or non-maintained emergency lighting and also the emergency power supply to a satellite luminaire. Satellite emergency luminaire: a luminaire for maintained or non-maintained operation and which derives its emergency operation supply from an associated compound self-contained emergency luminaire. A) Luminaire including test device: the luminaire contains a self-test module for testing purposes. B) Luminaire including remote test device: the system is tested remotely by a centralised panel. C) Luminaire with inhibiting mode: a control mode used to inhibit the emergency lighting luminaire from operating, thus preventing the discharge of the emergency lighting batteries at times when the building is unoccupied. If a mains failure occurs at such a time, the batteries will remain fully charged so that the building can be occupied when required. It is performed by an inhibitor switch that must be interfaced with other building services so that the premises cannot be inadvertently occupied without the emergency lighting being recommissioned. D) High risk task luminaire: for risk task area lighting in areas of high risk, the maintained luminance shall not be less than 10% of the required maintained luminance for the task under normal lighting conditions. This will be subject to a minimum luminance of 15 lux. The uniformity ratio for task area lighting should be a minimum of 10:1 (0.1). The minimum duration shall be the period for which the risk presents to occupants. The time required to evacuate the premises depends on their size and complexity. The duration itself is dependent not only on evacuation time but also on whether the premises are evacuated immediately the power and normal lighting fails and / or are reoccupied immediately the supply is restored. The minimum duration of an emergency escape lighting system is 1 hour. A minimum duration of 3 hours should be used for emergency escape lighting if the premises are not evacuated immediately, as in the case of sleeping accommodation, for example, or if the premises will be reoccupied immediately the supply is restored without waiting for the batteries to be recharged. One hour’s duration should only be used if the premises are evacuated immediately on supply failure and not reoccupied until full capacity has been restored to the batteries. BS 5266 contains detailed information on the recommended duration of systems in various premises. [x][***] – Self-contained, Non-maintained, ***, 3 hours duration. *** This is added as applicable at the time of installation. Having decided on your basic system, consideration should now be given to the siting of the lighting units and signs within the particular premises involved. This will then form the basis on which your selection of equipment can be made. Safelincs has provided a graphical guide for the location of emergency lights. Lighting units and signs should be sited so as to clearly show the exit routes leading to the final exits from the premises. Where the exit route or final exit is not readily identifiable, a sign should be utilised rather than a lighting unit. Particular attention should be paid to individual stairways, changes in floor level, corridor intersections, changes in direction, the outside of each final exit, control / plant rooms, lifts, toilet areas over 8m2 (although there is an argument for providing all toilets with public access, and especially those for the disabled, with emergency lighting). Access to fire alarm call points and fire fighting equipment should be clearly illuminated. In general, if careful consideration is given to siting the luminaires and signs to cover these areas, the completed scheme will meet most requirements. It is not necessary to provide individual lights (luminaires) for each item above, but there should be a sufficient overall level of light to allow them to be visible and usable. N.B: detailed computer point calculations or luminaire manufacturer’s spacing tables should be used. The above is a brief summary and we recommend that the appropriate standard is studied to gain a full understanding of what is involved. BS 5266 recommends the provision of horizontal illumination at floor level along the centre line of a defined escape route (permanently unobstructed) not less than 1 lux, and 0.5 lux for anti-panic areas, to exclude a 0.5m border around the route. In addition, for escape routes of up to 2m wide, 50% of the route width should be lit to a minimum of 1 lux. Wider escape routes can be treated as a number of 2m wide bands. The actual degree of illumination should be closely related to the nature of both the premises and its occupants, with special consideration being given to care homes for the elderly, hospitals, crowded venues such as pubs, nightclubs and supermarkets, and to whether or not the premises have overnight accommodation, e.g. hotels. The level of illumination in certain rooms and areas within a building will vary depending on their use; all this information is contained in the appendices to BS 5266-1: 2011. N.B: The above is a brief summary and we recommend that the appropriate standard is studied to gain a full understanding of what is involved. BS 5266 and the European Standard both require written declarations of compliance to be available on site for inspection. These should detail the quality of the installation and its conformance to IEE regulations, including the main circuit of the normal lighting system feeding non-maintained fittings. Photometric performance is required and evidence of compliance with light levels has to be supplied by the system designer. On completion of the installation of the emergency lighting system, or part thereof, a completion certificate should be supplied by the installer to the occupier / owner of the premises. A declaration of satisfactory test of operation is necessary and a log of all system tests and results must be maintained. System logbooks, with commissioning forms, testing forms and instructions, should be provided by the installer. A free fire safety logbook with sections for emergency lighting tests can be downloaded free from Safelincs. Finally, to ensure that the system remains at full operational status, essential servicing should be specified. This would usually be performed as part of the testing routine, but in the case of consumable items such as replacement lamps, spares should be provided for immediate use. In a system with a single switch for the whole building or a large circuit, after simulating the mains failure it is necessary for the tester to walk the whole building or circuit, to check all emergency luminaire are operating correctly. After restoring the mains supply, the whole building or circuit must be walked again, to check that the emergency lights are recharging. If the emergency luminaires are individually switched, only a single walk around the building will be needed. However, the test switches could spoil the decor of the building and they must be of a type that is tamper proof. After the tests, it is recommended that the performance of the system is logged in the fire safety logbook. If the costs of an engineer’s time and the disruption caused by manual testing are excessive, self-testing emergency lighting should be considered. Different formats are available to match particular site requirements. However, the results of the monthly and annual tests must still be recorded. BS EN 50172:2004 / BS 5266-8:2004 (Emergency escape lighting systems) specifies the minimum provision and testing of emergency lighting for different premises. Additional information on servicing can be found in BS 5266-1: 2011 (Code of practice for the emergency lighting of premises). Regular servicing is essential. The occupier / owner of the premises shall appoint a competent person to supervise servicing of the system. This person shall be given sufficient authority to ensure the carrying out of any work necessary to maintain the system in correct operational mode. Because of the possibility of a failure of the normal lighting supply occurring shortly after a period of testing of the emergency lighting system or during the subsequent recharge period, all full duration tests shall, wherever possible, be undertaken just before a time of low risk to allow for battery recharge. Alternatively, suitable temporary arrangements shall be made until the batteries have been recharged. The following minimum inspections and tests shall be carried out at the intervals recommended below. The regulating authority may require specific tests. This check only applies to emergency lighting systems with a central back-up battery system. In this case, there is a daily visual inspection of indicators on the central power supply to identify that the system is operational. No test of operation is required. This test does not apply to emergency lighting with self-contained back-up batteries in each unit (standard emergency lighting). All emergency lighting systems must be tested monthly. The test is a short functional test in accordance with BS EN 50172:2004 / BS 5266-8:2004. The period of simulated failure should be sufficient for the purpose of this test while minimising damage to the system components, e.g. lamps. During this period, all luminaires and signs shall be checked to ensure that they are present, clean and functioning correctly. A test for the full rated duration of the emergency lights (e.g. 3 hours) must be carried out. The emergency lights must still be working at the end of this test. The result must be recorded and, if failures are detected, these must be remedied as soon as possible. It is common for fire alarm servicing companies to carry out the annual emergency light ‘drain’ test at the same time as they carry out fire alarm system maintenance, as this fills the waiting time of the ‘drain’ test with useful activity. Emergency lighting is now covered by a series of interdependent standards that can be seen as forming a hierarchy as shown below. BS 5266-1: 2011 Code of practice for emergency lighting of premises. Gives general rules and guidance on the provision and operation of emergency lighting in most premises other than dwelling houses. BS EN 1838:1999 / BS 5266-7:1999 Lighting applications – emergency lighting. Specifies the illumination to be provided by emergency lighting (including luminance, duration and colour). BS EN 50172:2004 / BS 5266-8:2004 Emergency escape lighting systems. Specifies the minimum provision and testing of emergency lighting for different premises. 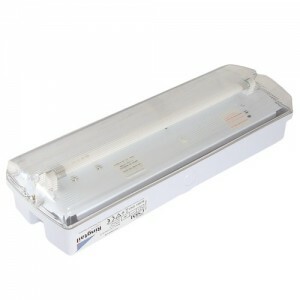 BS EN 60598-1: 2008 Luminaires. General requirements and tests. See the 60598 series for particular requirements. BS EN 50171:2001 Central power supply systems. Specifies central power supply systems for emergency lighting luminaries. Visit your local reference library or purchase copies of the requisite standards from BSI online; insert the BS number to see which titles are current. The links may not be inclusive but will give an indication of the guidance available. The HM Government entry level guides to the RRFSO for different types of non-domestic premises and the communal areas in HMOs each have a section entitled “Further guidance on emergency escape lighting”, which provide additional relevant information. The guides can be accessed via this link: Regulatory Reform (Fire Safety) Order guides.